Krishna consciousness is everywhere—it’s not bound by mundane geography. Although you don't always see it, it’s the natural culture of the soul—common to everyone. It used to be common to all parts of this world, but over time, it has become fragmented into many different religions. It is still known and practiced mainly in India - which is mainly where Krishna appears when He incarnates on Earth. One could say that Krishna Himself "started" Krishna consciousness. He came to Vrindavan, India (circa 3200 B.C.) and spoke the Bhagavad-gita—the comprehensive manual for Krishna consciousness. Krishna came again as Chaitanya Mahaprabhu, to West Bengal, India, at the end of the fifteenth century, to practically demonstrate to the general public how to practice Krishna consciousness. The teacher, or acharya responsible for bringing Krishna consciousness out of India at the end of the twentieth century and spreading it all over the world is His Divine Grace A.C. Bhaktivedanta Swami Prabhupada. Krishna's book—The Bhagavad-gita - the essence of all Krishna's instructions on how to understand reality; What is matter? What is spirit? Who controls both? 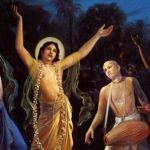 Chaitanya Mahaprabhu—Krishna's latest incarnation, as His own devotee, shows practically how to live the knowledge contained in The Bhagavad-gita. 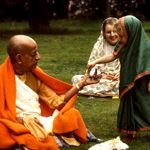 His Divine Grace A.C. Bhaktivedanta Swami Prabhupada—he left India on a steamship for the USA in 1965 with a trunk full of books and the unshakable determination to give the rest of the world what they had forgotten. 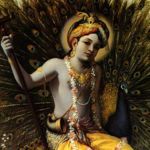 History of the Hare Krishna Movement—How did Krishna's teachings in The Bhagavad-gita come down through history and become spread all over the world? Is the International Society for Krishna Consciousness part of "Hinduism?" More about the Krishna consciousness movement— historical and philosophical roots. History of the bhakti (Krishna consciousness) tradition—how the teachings of Lord Krishna have been passed down throughout history.